This one-day continuing education conference will be held on May 2nd and May 3rd. The conference can be accessed through Georgia's VICS system. Please register using one of the two VICS registrations and contact your local VICS Coordinator to schedule your site as a VICS participant. A three-hour course from 2-5 p.m. beginning with a fifteen-minute didactic presentation on applicable issues of CLIA regulation, quality control, and infection control. This will be followed by fifteen minutes on interpretation of VWM and application to diagnosis of vaginitis, utilizing lecture, PowerPoint presentation, and group discussion. The remaining two and one-half hours consists of experiential training, including laboratory practicum on examination of saline and KOH vaginal wet mounts (VWM). During this portion of the training, participants will have an opportunity for group discussion, explanation, and demonstration, as well as practice and return demonstration. The course fee will be waived for UCSF residents. This activity has been planned and implemented in accordance with the accreditation requirements and policies of the Accreditation Council for Continuing Medical Education (ACCME) through the joint providership of the Curry International Tuberculosis Center and CAPTC. The Curry International Tuberculosis Center is accredited by the ACCME to provide continuing medical education for physicians. This conference is approved for 3 continuing education hours. The Curry International Tuberculosis Center designates this educational activity for a maximum of 3 AMA PRA Category 1 Credit(s)TM. Physicians should only claim credit commensurate with the extent of their participation in the activity. The Curry International Tuberculosis Center is approved as a provider of continuing education by the California State Board of Registered Nurses, Provider Number CEP 12308. This educational conference is approved for 3 continuing education hours. Board requirements prevent us from offering CE credit to people who arrive more than 15 minutes after the start of the training or leave the training early. Therefore, partial credit will not be awarded. 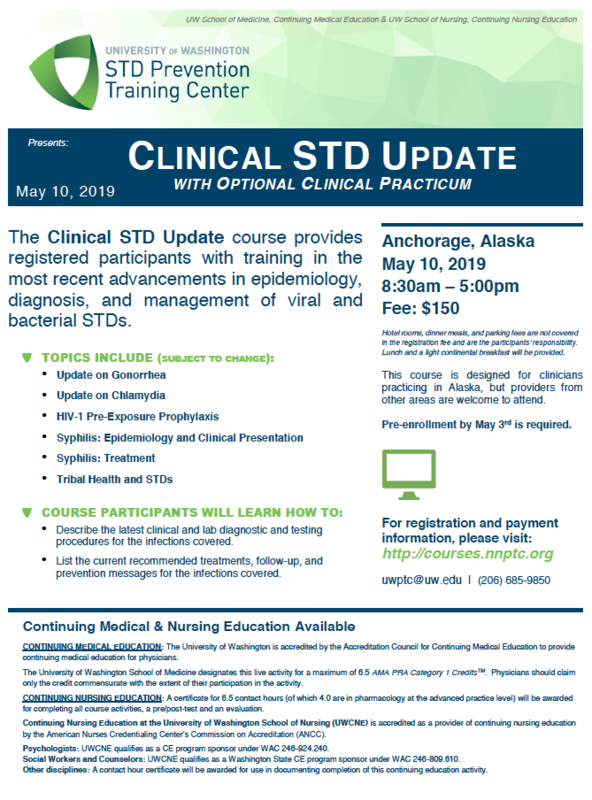 The Anchorage Clinical STD Update in Anchorage, Alaska is a 1-day didactic course which provides registered participants with training in the most recent advancements in epidemiology, diagnosis, and management of viral and bacterial STDs. Although focusing on STDs in Alaska, clinicians from any state are welcome to attend. CME/CNE is offered for this class. Pre-enrollment by May 3rd is required. After registering online, you will recieve an email with complete course details. Hotel rooms, dinner meals, and parking fees are not covered in the registration fee and are the participants’ responsibility. Lunch and a light continental breakfast will be provided. CONTINUING MEDICAL EDUCATION: The University of Washington is accredited by the Accreditation Council for Continuing Medical Education to provide continuing medical education for physicians. The University of Washington School of Medicine designates this live activity for a maximum of 6.5 AMA PRA Category 1 CreditsTM. Physicians should claim only the credit commensurate with the extent of their participation in the activity. CONTINUING NURSING EDUCATION: A certificate for 6.5 contact hours (of which 4.0 are in pharmacology at the advanced practice level) will be awarded for completing all course activities, a pre/post-test and an evaluation. Continuing Nursing Education at the University of Washington School of Nursing (UWCNE) is accredited as a provider of continuing nursing education by the American Nurses Credentialing Center’s Commission on Accreditation (ANCC). Psychologists: UWCNE qualifies as a CE program sponsor under WAC 246-924.240. Social Workers and Counselors: UWCNE qualifies as a Washington State CE program sponsor under WAC 246-809.610. Other disciplines: A contact hour certificate will be awarded for use in documenting completion of this continuing education activity. Cancellation policy: Full refunds for cancellations 14 days or more prior to training. 50% refund for cancellations 8-14 days prior. No refunds for cancellations within 7 days of trainings. 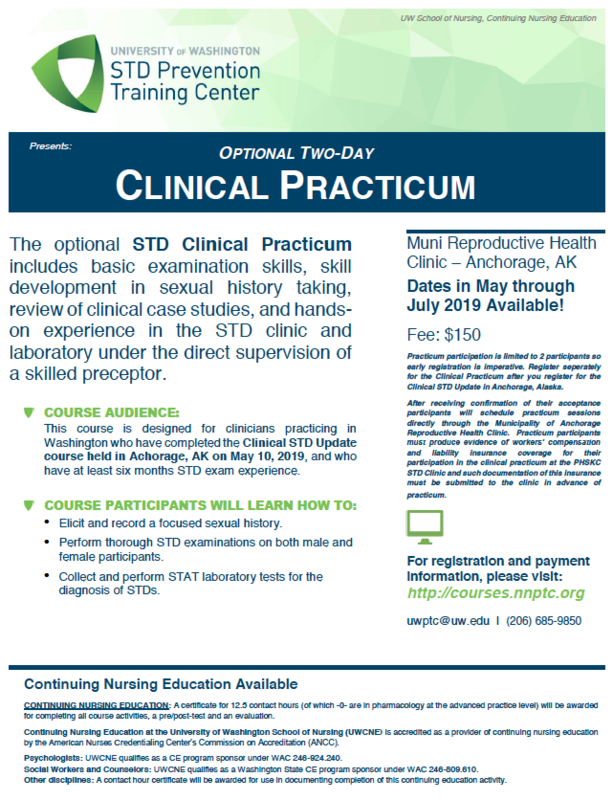 An optional 2-day clinical practicum is available to participants who complete the "Clinical STD Update" in Anchorage, Alaska on May 10, 2019. Practica are scheduled to take place within 2-3 months following students' completion of the didactic portion of the course - your training dates will be scheduled after you register for the practicum. The clinical practicum includes basic examination skills, skill development in sexual history taking, review of clinical case studies, and hands-on experience in the STD clinic and laboratory. The practicum includes participation in performing STD-related examination of patients in the presence of a skilled preceptor. Laboratory training includes hands-on training in the practice of rapid syphilis tests and saline and darkfield microscopy. Continuing Education is available. The practicum is designed for clinicians and for students in medical professions training programs who have had previous training or experience in performing pelvic exams. Continuing Nursing Education: A certificate for 12.5 contact hours (of which -0- are in pharmacology at the advanced practice level) will be awarded for completing all course activities, a pre/post-test and an evaluation. Clinical courses features pre-course self-study followed by 3 days of on-site training that includes case discussion, clinical skills practicum, and hands-on laboratory instruction (wet mount). Healthcare professionals (physicians, nurse practitioners, physician assistants, certified nurse midwives, nurses) in public or private practice who examine and treat individuals at risk for STDs/HIV. Applicants may include clinicians who work in family planning, adolescent health, women’s health, primary care, urgent care, or community health centers. This 1-day conference is for a clinical audience and will cover the following topics: epidemiology of STIs and HIV in Oklahoma, HIV prevention tools, syphilis update and congenital syphilis, complex case studies, and sexual history taking. This 2-day didactic STD Update course provides participants with training in the most recent advancements in the epidemiology, diagnosis, and management of viral & bacterial STDs. This course is designed for clinicians practicing in Washington, but clinicians from other areas are welcome to attend. An optional 2-day clinical practicum is available to participants who complete this Update—must register seperately. √ Describe the latest clinical and lab diagnostic and testing procedures for the infections covered. √ List the current recommended treatments, follow-up, and prevention messages for the sexually transmitted infections covered. Seating is limited. Pre-enrollment by June 7th, 2019 is required. Hotel rooms, dinner meals, and parking fees are not covered in the registration fee and are the participants’ responsibility. Lunch and a continental breakfast will be provided each day. The University of Washington School of Medicine designates this live activity for a maximum of 12.5 AMA PRA Category 1 CreditsTM. Physicians should claim only the credit commensurate with the extent of their participation in the activity. CONTINUING NURSING EDUCATION: A certificate for 12.5 contact hours (of which 6.0 are in pharmacology at the advanced practice level) will be awarded for completing all course activities, a pre/post-test and an evaluation. 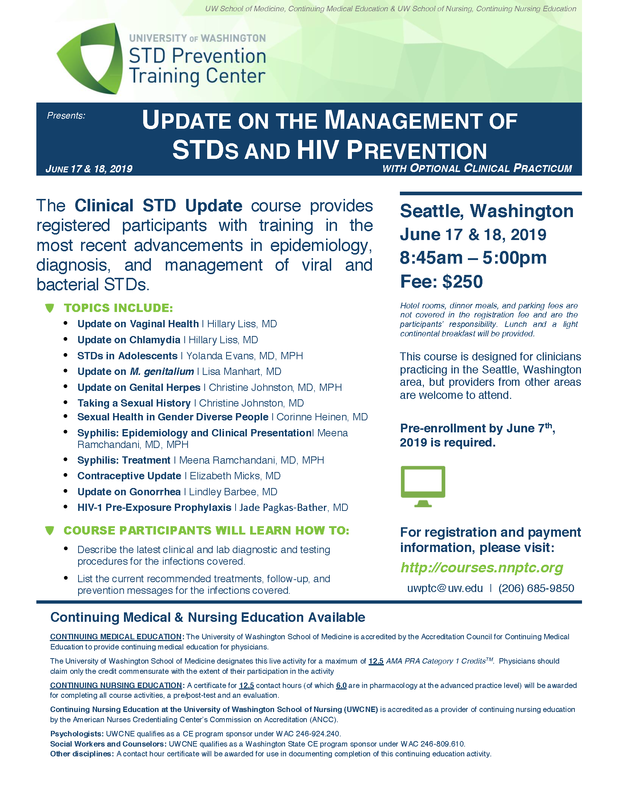 An optional 2-day clinical practicum is available to participants who complete the "Clinical STD Update" in Seattle, WA on June 17 & 18, 2019. Continuing Nursing Education: A certificate for 12.5 contact hours (of which -0- are in pharmacology at the advanced practice level) will be awarded for completing all course activities, a pre/post test and an evaluation. Food: Light breakfast will be provided. Lunch is on your own. Continuing Education: 4.5 credit hours are awarded upon completion of the course. An optional 2-day clinical practicum is available to participants who complete the "Clinical STD Update" in Boise, ID on August 09, 2019. Clinical Courses feature 2 days of onsite training that includes 2015 STD guideline review, case discussions, use of Motivational Interviewing and laboratory instruction PLUS 1/2 day of clinical shadowing to be scheduled within three weeks of completion of didactic sessions. Completion of the registration process DOES NOT guarantee a training slot. You will be contacted by the Program Coordinator if you are in the target audience and have been accepted to a session. An optional 2-day clinical practicum is available to participants who complete the "Clinical STD Update" in Eugene, OR on October 17, 2019. This training is for Infectious Disease fellows and fellows whose practices include prevention and treatment of STDs. The course features 16 hours of didactic lectures and case discussions as well as 8 hours of hands-on laboratory workshop (wet mounts/darkfield) and an optional clinical shadowing opportunity at either Massachusetts General Hospital Sexual Health Clinic in Boston or Miriam Hospital STD Clinic in Rhode Island. There is no CME/CEU credit offered with this course.